Twenty minutes and two easy steps to feel smug and warm. Step 1: The battery is under your feet. Remove the two battery cover bolts by popping up the seat, you can see them located by the hinge and they're removed with a 4mm allen key. 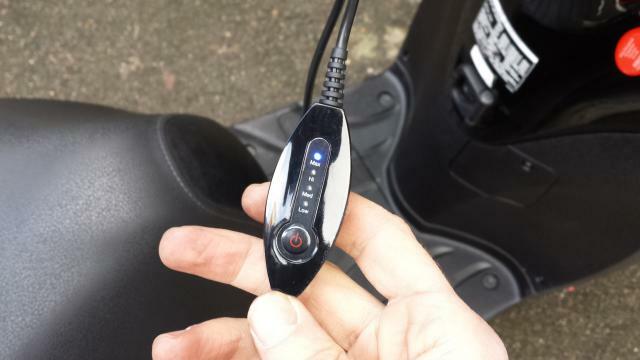 Once the cover is off, remove the bar holding the battery in place with a 10mm socket. 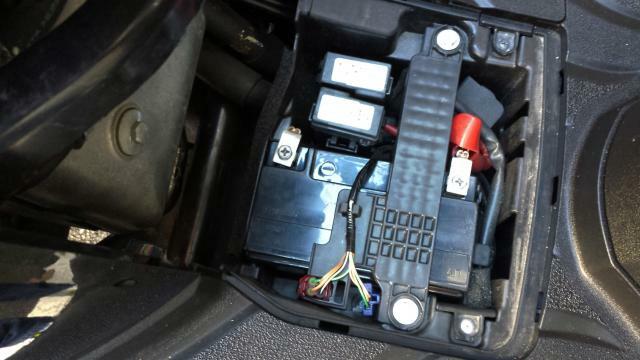 Disconnect the battery terminals, negative first! 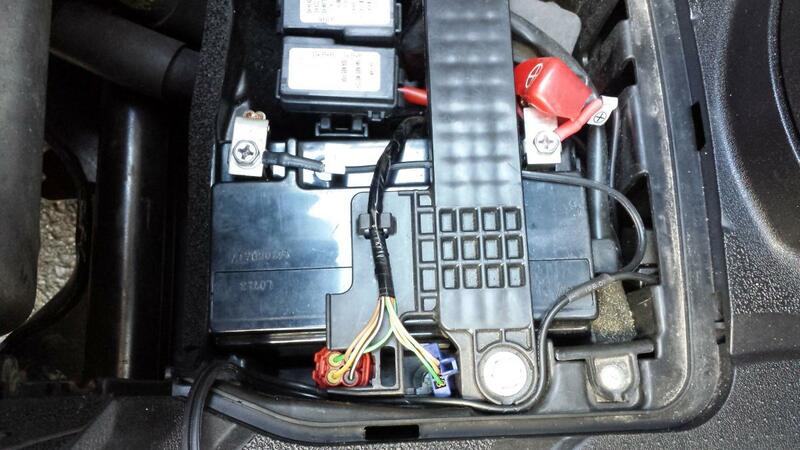 Step 2: There's plenty of room under the battery cover to run the cables, so you could just connect it up and off you go, but if you remove the bar holding the battery then you can neatly route the cables. I've tucked the slightly bulky fuse in the little hole on the right. You can run the cable infront of the frame (pictured top left of first image), which will keep it from sitting close to the engine's head. 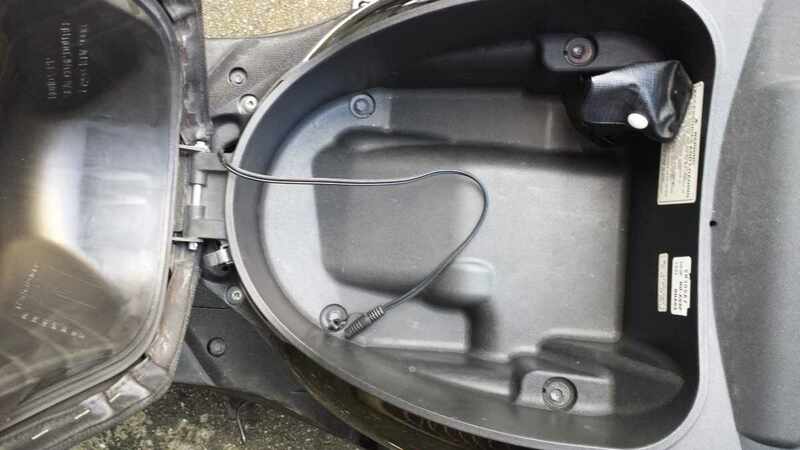 Keep the cable in place by using a cable tie around the bottom slot in the bodywork (bottom left of photo) where the battery cover locates in to. This will prevent the cable moving around. The cover should still fit flush but if not, you can cut a few mm off to ensure it doesn't foul the cable tie. Step 3: The battery cover has a decent gap at the top where it meets the seat, plenty of space to run the cable through and into the underseat storage. Once the battery cover is in place. If you want to, you could drill a small hole in the bottom of the underseat storage and run the cable through that but I see no real need. When you're not using the heated vest, you can pop the seat and sling the end of the connector in there. That's it, you're home and dry! Or at least, wet, a long way from home but probably fairly warm.